Just a quick post for a quick project: My Iris Mudra Cuff. I got a kit for this little “sparkly” at my LYS, and it is a great way to get a little “knit-isfaction” without any fuss. 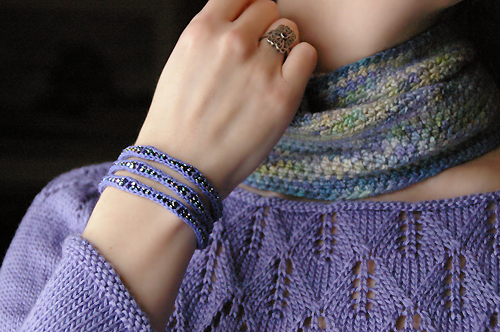 It’s called the Mudra Cuff, a Laura Nelkin Design, and the kit came with everything except the size 0 dpn needles. It was nice to just have it all together ready to knit on a whim. It’s all i-cord, but the beads keep it from dragging on and on. I finished my bracelet over two evenings, and love the result. Of course, anything that involves sparkly crystals is bound to be a hit with me 😉 ! I’ll be teaching a jewelry knitting class over a Knit New Haven and we’ll be using this kit as a spring-board, so check out the Class Schedule if you’d like to join me and knit a little sparkle too!